The Authorized Version by Maxine Brady. From The Monopoly Book, Strategy and Tactics, published in 1975. The 30s, The Depression, and Darrow by Parker Brothers. From the 50th anniversary edition published in 1985. From Rags to Riches by Parker Brothers. History at Parker Brothers web site in 1996. The Fascinating Game of Finance by Knapp Toys and Games. 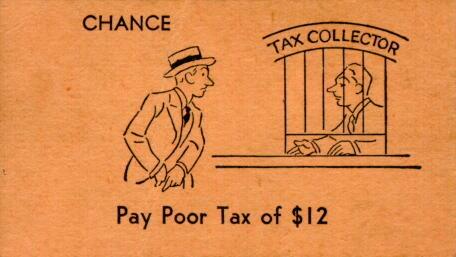 A monopoly game published in 1932. How old is my Monopoly set? If your board has Charles Darrow 1933 printed on the jail square. Changes to Chance &AMP; Community Chest "Go Back to Baltic Avenue" means you are playing with a full deck. Old Card Illustrations Chance &AMP; Community Chest cards before the Rich Uncle. Old Tokens Have you seen these before? Old Monopoly Sets Pictures from the collection of Chris Mospaw. Darrow White Box Mass produced by Charles Darrow in 1933 and sold by John Wanamaker. Catalogue of Famous Parker Games 1947-1948 The Most Famous and Largest Selling Games in the World. Lizzie J. Magie In 1903 she invents a real estate board game. The Landlord's Game How Monopoly invented itself as a folk game. Charles Darrow The many careers of Charles Darrow. Daniel W. Layman, Jr. He plays Monopoly in the 1920s and sells it as Finance. Ruth Hoskins Why Monopoly uses Atlantic City street names. Charles Todd Introduces Monopoly to Charles and Esther Darrow. Marven Gardens There is no Marvin Gardens. Parker Brothers Why they claim Darrow invented the game. The $500 Buyout Parker buys Lizzie Magie's patent. The $10,000 Buyout Parker buys Finance and Inflation. Louis &AMP; Fred Thun They make and sell Monopoly in 1931. Cover Story How Darrow is inspired to invent Monopoly. Bulls &AMP; Bears Parker claims Darrow invented another game.